Exophthalmos, also known as proptosis, is a medical term for a bulging or protruding eyeball or eyeballs. It's most often caused by thyroid eye disease. There's also a small risk of the optic nerve (which transmits signals from the eye to the brain) becoming compressed if you have exophthalmos, which may affect your sight permanently if it isn't treated quickly. Many of the symptoms of thyroid eye disease tend to improve over time, although this can take a number of years. There's a chance your eyes will continue to protrude if corrective surgery isn't carried out. Some people with exophthalmos are left with long-term vision problems, such as double vision. However, permanent visual impairment is rare if the condition is identified and treated promptly. See your GP or an optometrist (optician) if you notice that one or both of your eyes are protruding. It's important to identify the underlying cause so appropriate treatment can be given. Treatment is often more effective if it's started as soon as possible. If necessary, your GP or optometrist can refer you to an ophthalmologist (a specialist in diagnosing and treating eye conditions) for further assessment. If you're referred to an ophthalmologist, they'll check how well you're able to move your eyes. They may also use an instrument called an exophthalmometer to measure how far your eyeball protrudes. If the ophthalmologist wants to examine your eye socket in more detail, a computerised tomography (CT) scan or magnetic resonance imaging (MRI) scan may be carried out. You may also have a blood test to assess how well your thyroid gland is working and you may be referred to an endocrinologist (a specialist in conditions affecting glands and hormones) if you're found to have abnormal thyroid hormone levels. One of the main causes of exophthalmos in the UK is thyroid eye disease, also known as Graves' ophthalmopathy. This is an autoimmune condition that affects around one in every three people with an overactive thyroid gland (hyperthyroidism) caused by Graves' disease. It's particularly common in women aged 30-50 and people who smoke. An autoimmune condition is where the immune system (the body's defence against illness and infection) mistakenly attacks healthy tissue. In the case of thyroid eye disease, the immune system attacks the muscles and fatty tissues around and behind the eye, causing them to become inflamed (swollen). Thyroid eye disease can also occasionally affect people with an underactive thyroid gland (hypothyroidism) and, in rare cases, people with seemingly normal thyroid function. Exophthalmos can also have a number of other causes, but these are generally less common than thyroid eye disease. Exophthalmos can also affect newborn babies if they're born with eye sockets that are shallower than normal. Other useful measures include stopping smoking, using artificial tears to reduce eye dryness and irritation, and wearing special lenses to correct double vision. In other cases, treatment will vary depending on the underlying cause. For example, treatments such as radiotherapy, chemotherapy and/or surgery may be recommended if exophthalmos is caused by a tumour. Read more about treating exophthalmos. You may also experience some double vision. In severe cases of exophthalmos, you may not be able to close your eyes properly. This can damage your corneas (the transparent tissue that covers the front of your eye) by causing them to dry out. 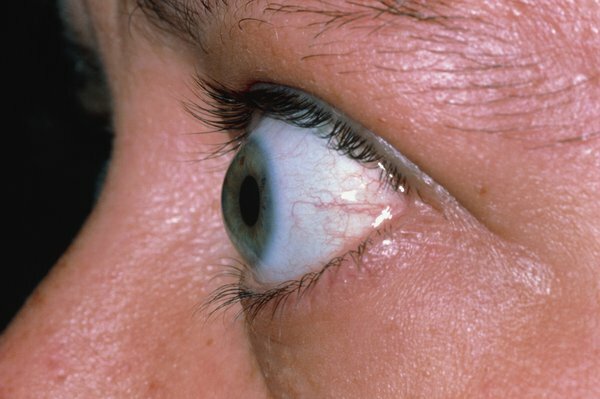 If your corneas become very dry, an infection or ulcers (open sores) may develop. These could damage your vision if left untreated.